Nastassia’s work was first introduced to me via Facebook friend René Couret. I was wowed by her level of creativity, especially with her “Selfies” which has inspired me to come out of my shell and work on my own self-portrait project. Additionally, I love her use of symbolism and frequently marvel at her ability with photographic design. Find out more about what makes this beautiful and talented light scribe tick by reading on. How did you get into photography (or a specific genre of photography)? I started taking pictures around the age of 14 with a camera I bought after saving money working at a bookstore. I loved capturing moments of my friends in extracurricular school activities. Once I got to college, I took up a few darkroom classes and a digital course where I was introduced to Adobe Photoshop. When bored, I enjoyed taking images of myself and editing them into scenes and ideas. It was quite entertaining for me to do when my friends weren’t around to hang out with. People can currently view digital versions of myself portraits online and take it as creative self-expressions of my personal thoughts. However they interpret it is completely up to them. There are many. But just to name a few, I love the old masters of painting, such as Salvador Dali, Pablo Picasso and René Magritte. Their surreal paintings take me to another world. Artistic photographers, like Cindy Sherman and Lorna Simpson because they use themselves as the subjects in their brilliant work. I love celebrity portrait photographer, Annie Leibovitz, because she’s beautifully capture some of the most iconic people of the 20th century. I take all kinds of pictures, weddings, engagements, concerts, special events, but my favorites are the ones in which I am the subject. Having an idea in mind and seeing it transpire to something tangible that others can look at and appreciate is a great feeling. To express myself in that medium is wonderful because I’m able to create another reality for myself, a place where my dreams become images that others can see. Visually, I love how colorful and surreal some of the images turn out to be. [I] truly believe it’s a direct reflection of me. As a creative soul at heart, I feel whole when I’m using my talent to express myself. As a photographer, my artistic self-portraits (and other works) have been an interesting way for me to connect with others in ways I wouldn’t be able to otherwise. The messages I receive are truly awe-inspiring and touching. Recently, a girl from Texas wrote to me saying she grew up deeply discontent with the color of her skin. 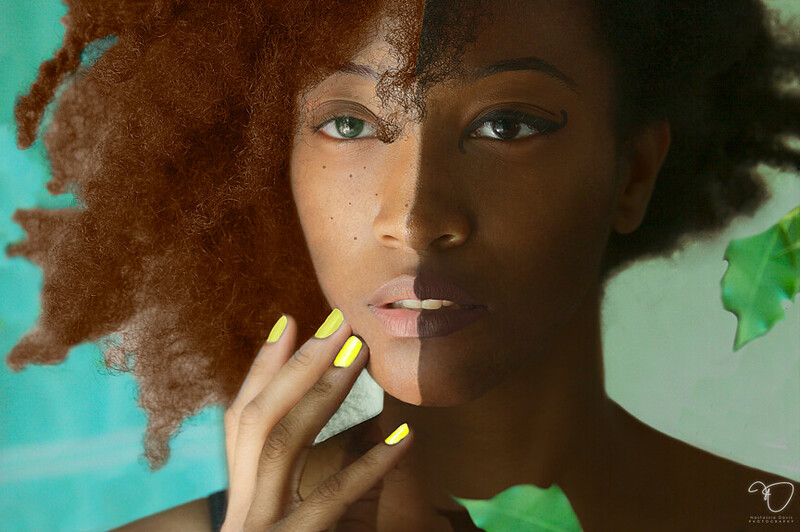 The “mixed” photo split in half of one dark skinned light skin girl reminded her of that internal struggle that she had survived. My photo she saw reminded her that she was beautiful. Another person wrote me saying that my college debt photo was “his life summed up in one image”. The fact that I can create mere pictures that others can relate to or helps them feel better about themselves humbles me and is one of the greatest joys my work brings. I hold digital photography workshops at college universities and do presentations of my work. Next week I’ll be speaking about my photography at a Summer Reading Program in NJ to art students. I look forward to doing even more in the future! I enjoy using a long exposure technique; I’m always surprised with the results I get. My “Arise” and “ArchAndroid” self-portraits are a couple of great examples of that long exposure technique. Additionally, using the Clone tool is fun because it’s a quick and easy way to make an ordinary portrait something extraordinary. I want to sincerely thank you for this interview and for sharing my work with your viewers. I can be found on my twitter, Facebook and blog links which are listed on my official website – http://nastassiadavis.com. I also sell most of the work posted on my website. If anyone is interested in purchasing, please email me – contact@nastassiadavis.com. This week’s Influencer has been helping me get my photographic ish together since I started shooting seriously last year. 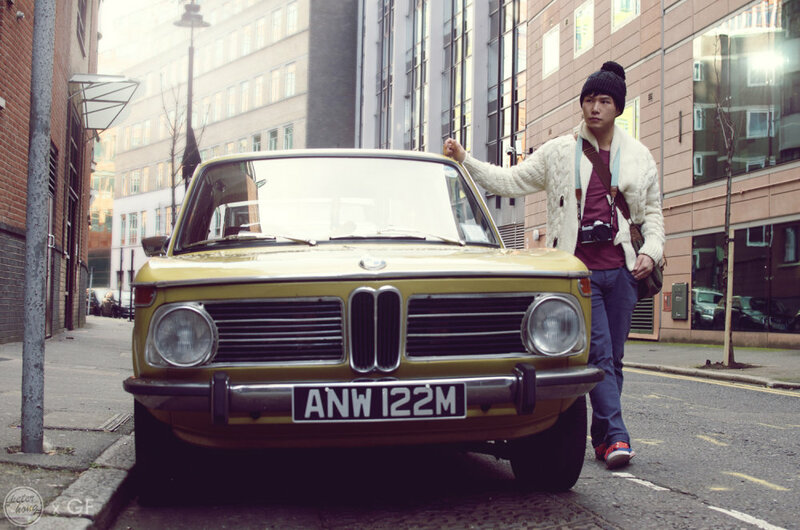 His name is Peter Hong of Peter Hong Photography. His images have a light and airy feel to that I enjoy; it’s an almost magical appeal. I also like the level of creativity he brings to his images. You can tell he really enjoys what he does. So, this week, I’d like you all to meet Peter Hong! I got into photography by accident. Before going to my year abroad in Japan I decided to find out a little about photography in the hope to be able to take better photos to document my time there. Unknown to me, I unlocked a secret passion for photography. I guess I knew I was getting addicted when I would spend hours watching how to videos and do loads of test shoots. I’m not sure since I take photos and edit them to the way I like it. I think the ones who like what I do will let me know and the ones who dislike my style would also tell me hahaha. But I think with art, to get better, you need to realize that you can’t please everybody. I’m really into Chase Jarvis, Edward McGowan, Alice Gao and Joey L. I like the way they see life through a lens. I like the fact that I don’t like spending time on something too much. I’m really fast in photo shoots and editing. It really helps to visualize what you are after before executing it. I guess the ability to share. I like sharing. I often do lots of tutorials and such. We all start off somewhere so it is nice to give back to the community! Kinda mentioned it in the last question hahaha. I created a profile on this site basically as part of a school assignment where we had to create or update a LinkedIn profile and have a means for others to view our work. Since I’m no fan of Slideshare I chose to use Behance. 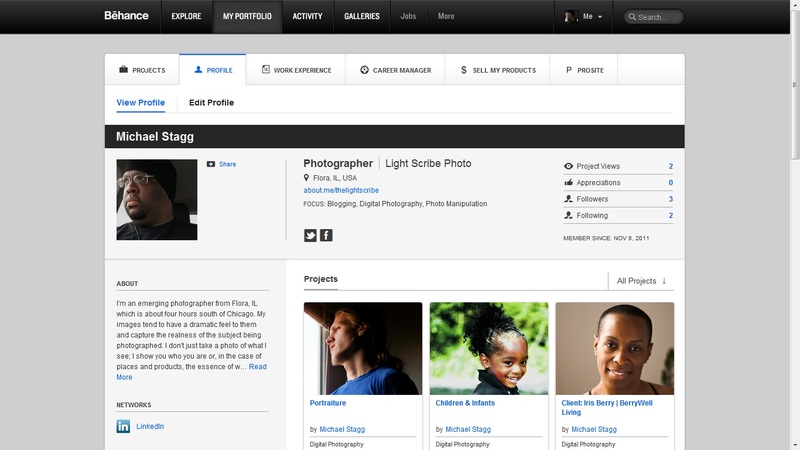 It’s easy to get set up and your portfolios – called Projects – can be displayed on LinkedIn. You can sell your work using an online store like Shopify or use their partner Fotomoto to sell prints. They also offer an option called Prosite that allows you to create a profession website for $11 a month or $99 a year. While I like the ease with which I can create photo galleries/projects I feel I need something a little more robust. I had SmugMug for several months but I wasn’t too fond of their interface. Setup and posting my images was simple enough; I usually uploaded photos via Adobe Lightroom. They offer options to sell products and prints as well as operate your own website through them but again, I just wasn’t feeling their interface and other options. It’s why I’m searching for something else now. Zenfolio seems to have it all! A better assortment of custom designed site pages, unlimited storage for photos and videos (in HD! ), a strong list of partner products and services to offer clients and so on. They are similarly priced to SmugMug in terms of annual fees but I think you would get so much more bang for your buck with Zenfolio and I’m leaning more toward them as my solution of choice. What online portfolio service do you use? Any others I should take a look at? Let me know in the comments below. Like Light Scribed: Michael Stagg Photography on Facebook!